Delicate and bright, these silver copper wire fairy lights resemble the whimsical twinkling of stars in the night sky. 100 high quality micro LED bulbs ensure ambient illumination and produce a warm white light. They consume up to 70% less power than other light sources and remain cool to the touch. Crafted from very thin, silver copper wires which can be effortlessly bent and shaped however you like. Powered by USB. While the USB plug is not waterproof, the copper wire string lights are. Total length: 32 ft. Distance between each bulb: 4". Lead wire: 12". Weight 0.25 pounds. 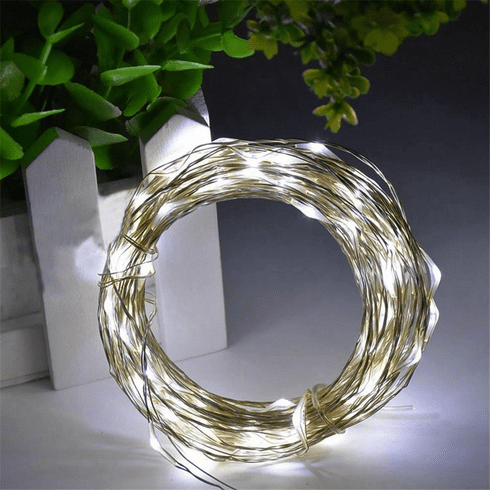 Copper LED Light Wire. UPC Number: 810851029491.